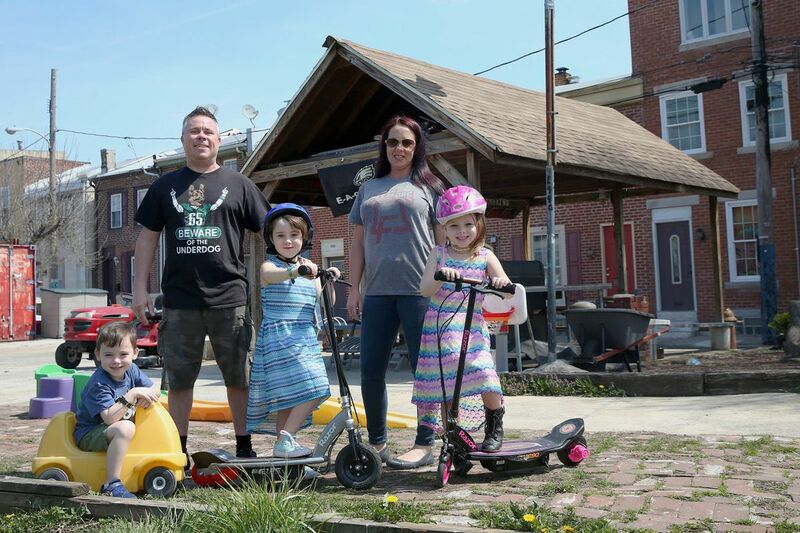 Frank Galdo, rear left; his wife, Nicole, rear right; and children Chloe, 8, in blue; Bella, 7, in pink; and Francis IV, 4, stand for a portrait at the lot across from their home in Fishtown on Friday, April 13, 2018. Galdo, who cleaned up the vacant city-owned lot, is seeking to assert ownership over the property, which he has transformed into a mini-park. Under the doctrine of adverse possession, property owners have to behave like property owners to keep from losing what's theirs — even when that owner is the city. That's the latest on "The Notorious Galdo Parcel," as it's proclaimed in giant letters painted on the side of a trailer parked on a Fishtown lot. For nearly three decades, Frank Galdo has taken care of the lot across from his home, replacing trash, prostitutes and drug addicts with grass, a concrete parking slab, fire pit, picnic tables and a tree house. But the lot is owned by the city, not Galdo, and in 2013, the city told him to remove his additions. Last month, the lifelong Fishtown resident got some good news about his legal fight: A state appeals court said the city is not immune from claims of adverse possession. In 1989, Galdo bought his home on Front Street near Lee and started sprucing up the eyesore across the street. The city had condemned the property in 1974 to temporarily reroute the Market-Frankford Line, since the construction of I-95 interfered with the tracks. Galdo contends the city hasn't used the property since 1976. His presence on the lot grew — until 2013, when the city posted a notice warning him that his use of the lot was unauthorized. Galdo took the city to court and lost in 2016 after the lower court found city was immune from adverse possession. Frank Galdo has been maintaining and improving for nearly 30 years in Fishtown. File art from October 2017. Last month a three-judge Commonwealth Court panel that had heard the case in October decided, 2-1, in Galdo's favor. Neither Galdo's lawyer, David Scaggs, of the Granger firm in Chester County, nor the city Law Department would comment on the case because of ongoing litigation. If the city appeals, the case could head to the state Supreme Court; otherwise, it returns to Common Pleas Court. After five years of trading rounds in court, Galdo said he was shaking when he saw that it was his lawyer calling him. "I thought I was going to lose," he said. "I felt relieved, but it's not over yet." Galdo and his wife, Nicole, celebrated with lunch after hearing from the lawyer and shared the news with their kids and Galdo's grandmother, who lives around the corner from the family. "So we ain't got to move?" asked Chloe, 9, the oldest child. "Not at this point," he responded. Galdo, who grew up around the corner, is wary of developers changing the place he's known all his life, and talks of moving if the city prevails in court. "There isn't a day I don't wake up and think about what's going to happen here," Galdo said. "It just feels like the neighborhood and city is closing in." This article has been corrected to state that if the city of Philadelphia appeals the Commonwealth Court decision the court that would hear the matter is the Pennsylvania Supreme Court.